The combination of Goats Milk, Unrefined Shea Butter and Honey makes this soap particularly beneficial for sensitive skin and dry skin conditions. Shea Butter is incredibly nourishing and moisturising for the skin. Goats milk soap is wonderful for people with dry or sensitive skin as it contains many vitamins and minerals. Goats milk soap is also excellent for children as it is mild and will not irritate even the most sensitive skin. 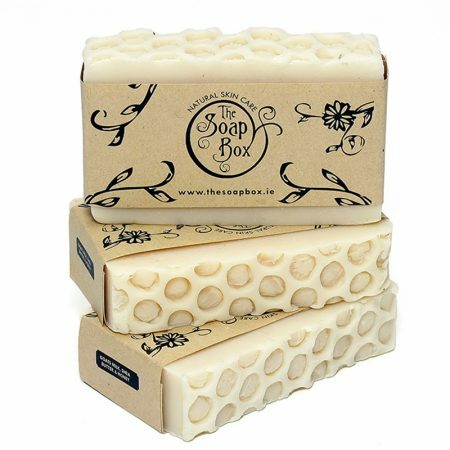 This soap is most frequently bought by our customers with very sensitive skin. Highly recommended by our customers for sensitive skin. Your skin is in for a treat with the Soapbox’s handmade, cold processed Goat’s Milk Shea Butter and Honey Soap. This method of soapmaking ensures that the soap retains it’s natural glycerine which is excellent for dry skin. A blend of olive, coconut and castor oil is used which results in a glycerine rich bar with a rich luscious long lasting lather. Beeswax is added for hardness. The scents in this range are from a blend of high quality pure essential oils, each with their own therapeutic properties. Each variety has it’s own natural exfoliant in the form of flower buds and seeds, citrus rind, wholegrains and seaweeds. The colour is obtained from plant roots and seeds. Talk about spoiling your skin! We hope you enjoy using our soaps as much as we enjoy making them. alcohol, harsh chemicals or petroleum products in our soaps. This is a range of 100% natural cold process soaps. This method of soapmaking ensures that the soap retains it’s natural glycerine which is excellent for the skin. A blend of food grade olive oil, coconut oil and caster oil is used which results in a glycerine rich bar with a rich luscious long lasting lather. Beewax is added for hardness. The scents in this range are from a blend of pure grade essential oils, each with its own therapeutic properties. Each variety of soap has its own natural exfolient in the form of flower buds and seeds, citrus rind, wholegrains and seaweeds. Plant roots and seeds provide the pigmenation. All Natural Ireland products are handmade in small batches, to ensure the finest quality. Hand made products are of the highest quality as they are not mass produced but hand crafted in a carefully controlled process.